KCP04 Nvidia Female Key Chain is a Miscellaneous key chain released in 2005. It contains a key chain with a minifigure. The minifigure has a brown ponytail, female smiley face, white torso and green pants. 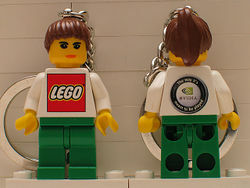 The front of the torso has the LEGO logo, and the back has the Nvidia logo with the phrase "The way it's meant to be played". Facts about "KCP04 Nvidia Female Key Chain"
This page was last edited on 11 January 2016, at 20:55.